New York indie pop trio fun. hadn’t even released their debut record, Aim and Ignite, when their Thursday night show at Schubas sold out. It’s not every day that a band quickly sells out a show before putting any music out, and can then go on to keep the audience in the palm of their hand for the entire gig only one month after the album’s release. fun. effortlessly managed to do just that last night, delivering a lively set to a crowd that was happy to sing along to every song from start to finish. The band – including core members Nate Ruess (formerly of The Format) and Andrew Dost (of Anathallo) as well as additional supporting musicians (for some reason the third main member, Jack Antonoff, was inexplicably missing) - played off the positive vibes and were clearly thrilled to be on stage. 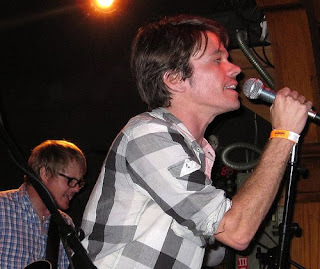 They played everything off the record plus two songs from The Format, “The First Single” (which kicked off with around 30 seconds of “Billie Jean” as a tribute to Michael Jackson) and an acoustic version of “She Doesn’t Get It.” Ruess dedicated “The Gambler” – a song about his parents – to his father, who was present working the merch stand. The front man seemed genuinely surprised and appreciative of Chicago’s warm response and commented that the band was blown away by the show selling out so quickly. Before the final song in the set, “Take Your Time (Coming Home),” they even brought out an old school Scottie Pippen jersey to express their love of the Windy City. fun. wrap up their current tour tonight in Minneapolis and will return to Chicago on October 28 for an opening slot with Taking Back Sunday at the House of Blues. 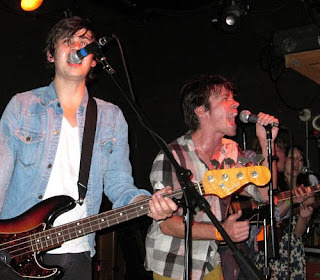 Ruess also mentioned that the band would be back in January on a headlining tour.